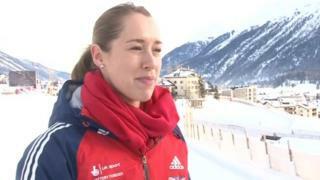 Kent skeleton athlete Lizzy Yarnold tells BBC South East Today she is confident in her ability and her current form with one year to go until the Winter Olympics in Sochi. The 24-year-old from West Kingsdown, near Sevenoaks, says she is hoping to develop and learn the Sochi track as quickly as possible ahead of the Games. Yarnold finished fourth in the world championships in St Moritz on Friday, with fellow Brit Shelly Rudman winning gold.